The Translators wrote this on the margin in reference to Jehovah-jireh: "That is, the LORD will see, or provide." There are two verses that illustrate the faith of Abraham that God would somehow see him through this trial. Verse 5 "...I and the lad will go yonder and worship, and come again unto you." also verse 8 "And Abraham said, My son, God will provide himself a lamb for a burnt offering..." And He did. This name was bestowed upon the place by Abraham. Jehovah-jireh helps us to know that God saw all of our need, and is interested in providing for our every need. Of course God has already provided for our greatest need: Salvation. He sent His Son Jesus Christ to die on the cross, in essence to suffer the penalty for our sins. Post Script: The picture is taken from the oil paintings of Caravaggio. If I could go back in time, I would ask Mr. Caravaggio to put a shirt on that angel, and perhaps trim his hair a little. 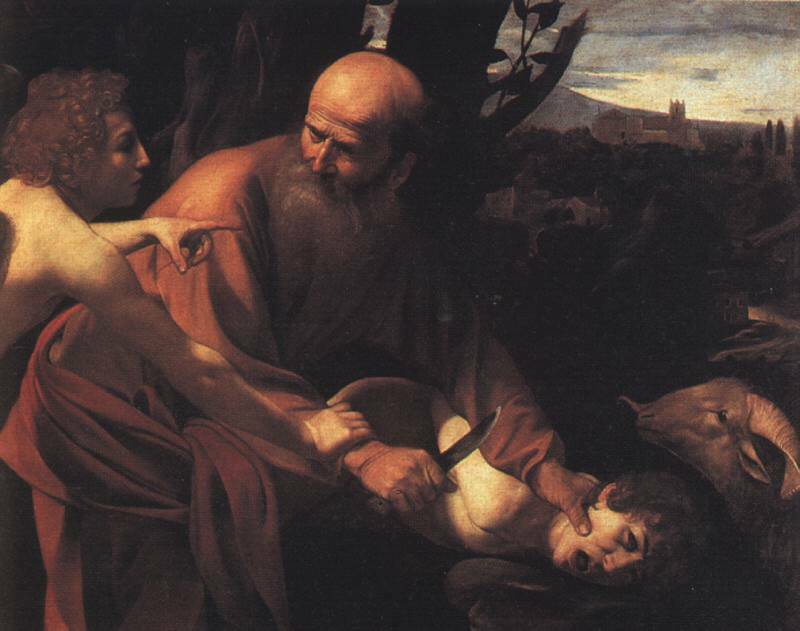 Also, Isaac really looked troubled in this picture - I would be too, if my dad tried this one on me. While I must confess, I have a hard time with this portion of the story of Abraham, I accept it by faith, because God is the Author and God cannot lie. I don't think the picture is accurate for the reason that Isaac was a willing sacrifice - as a type of Christ. This picture makes it look like he was totally against what was happening to him, as though he were being forced into submission and crying out all the while.